Clever, Crafty, Cookin' Mama: So Why WeShaboigen?? Note: My blog used to be called "Weshaboigen"
So my sister asked... So why WeShaboigen, what's that from? So I thought I would share it with her and you. It has something to do with stale snacks, not the beautiful fresh snacks pictured here, but a plate of snacks two weeks old and twice frozen... But first, some background. I keep a white board on our fridge at home. Now while most people would keep a shopping list or a time efficient things to do list, I keep wacky and strange phrases that have been uttered by family members. When the white board gets full, I'll transfer them to a hard copy and start over. So at any given time a complete stranger could walk into the house and be totally baffled by the sayings on our fridge, which has the most hilarious collection of our favorite inside jokes. So we work together, my hubby and me. We have a very frugal boss. She buys plastic flowers instead of real ones, and if the receipt doesn't say Walmart, you've payed too much. Well she's found a way to be frugal on snacks too. She goes to the local supermarket and collects the week old pastries, too old and decrepit to sell to the public and brings it to work where she promptly refreezes them and it is there they lie in wait for us. On snack day morning she proudly defrosts them and makes a beautiful display on a flowery plate and ceremoniously places them in our break room. 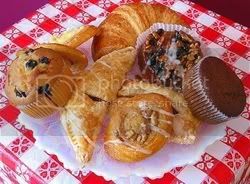 After a few years of these most of us have learned to stay clear of the snack plate, but there always seems to be the newbie or just plain person that is too hungry, and slowly the stale snacks disappear over the course of the morning. When our boss comes back and sees the almost empty plate, I'm SURE it only reinforces her idea that stale snacks are a good thing. ... But you've got to admit, Jenn, that the stale, frozen & thawed, burnt Mrs Fields chocolate chip with macadamia nut cookies were the bomb! Even if they did almost kill Doc.